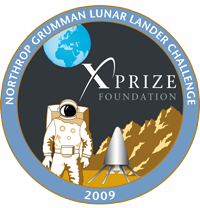 Today, we are very excited to announce the first group of 2009 Northrop Grumman Lunar Lander Challenge attempts! First off, a quick refresher about the prize, which is designed to accelerate technological developments supporting the commercial creation of vertical take-off and landing rockets with enhanced safety and performance. The Challenge is divided into two levels. Level 1, requires a rocket to take off from a designated launch area; climb to a low, fixed altitude; and fly for at least 90 seconds before landing precisely on a different landing pad. The flight must then be repeated in reverse. Both flights, along with all of the necessary preparation for each, must take place within a two and a half hour period. $500,000 in prizes were allocated to Level 1, including both the $350,000 first place prize previously awarded to Armadillo Aerospace as well as the presently unclaimed $150,000 award for second place. The more difficult course, Level 2, requires the rocket to fly for twice as long the Level 1 mission before landing precisely on a simulated lunar surface constructed with craters and boulders. The minimum flight times are calculated so that the Level 2 mission closely simulates the power needed to perform a real descent from lunar orbit down to the surface of the Moon. A $1 million First Place and a $500,000 second place prize remain to be claimed by the winners of Level 2. In previous years, the Northrop Grumman Lunar Lander Challenge prize money had only been available to teams who performed the required missions at a specific, single location on a particular weekend. This year, however, teams are permitted to make their prize winning attempts at a date and location of their choosing during a window that stretches through the end of October. At the end of the window, any teams that have accomplished the mission will be ranked based on the landing accuracy achieved in each of their rocket powered flights, and the prize purses will be awarded accordingly. Qualified teams are able to register for prize-winning attempts on a first-come, first-served basis, with a small crew of judges and observers traveling to meet the team at a venue of their choosing. Teams may submit registration forms through September 15, 2009, so we may continue to see new attempts added to this list. Armadillo Aerospace will attempt to claim a Level 2 purse from Caddo Mills, TX, on September 12 and 13. Masten Space Systems will attempt to claim purses in both levels from Mojave, CA, on September 15-16 (Level One), October 7-8 (Level Two), and October 28-29 (Level Two). Unreasonable Rocket will attempt to claim purses in both levels from Cantil, CA, on Oct 30-31. These launches will not be open to the general public unless otherwise specified by the teams themselves. However, we'll be doing our best to carry information about the launches to you all as quickly and completely as possible! Please join us in wishing each of these teams the best of luck. Their efforts and successes are an inspiration to all of us, and are an excellent boon to the space industry. Please also join us in expressing appreciation for our partners in this effort, without whom, none of this would be possible. These include: NASA's Centennial Challenges program, which provides the prize purses; Northrop Grumman, which donates the funds to cover the operation of the prize, and Spaceport America and others in southern New Mexico, who graciously hosted the first three years of the competition.